At Larsen Jewellery we are fortunate to spend our days working with couples helping to bring their dream rings to life. Every year we see new trends come and go and then there are the classics, the ones that are here to stay. Every couple holds a different story, and with each engagement ring, a journey is embarked on designing the perfect ring that captures both personality and style.The one piece of advice for any couple we work with is to remember that an engagement ring is for life; finding the perfect balance of you and something that is timeless can be an art. The most popular styles of engagement rings are the classics, solitaire with petite bands or those sprinkled with accent diamonds. Diamond halos and three stones rings are also considered as classics and like the solitaire, as each year passes they are here to stay. This is the classic style of engagement ring and by far the most popular, a round brilliant diamond usually in a six claw setting. 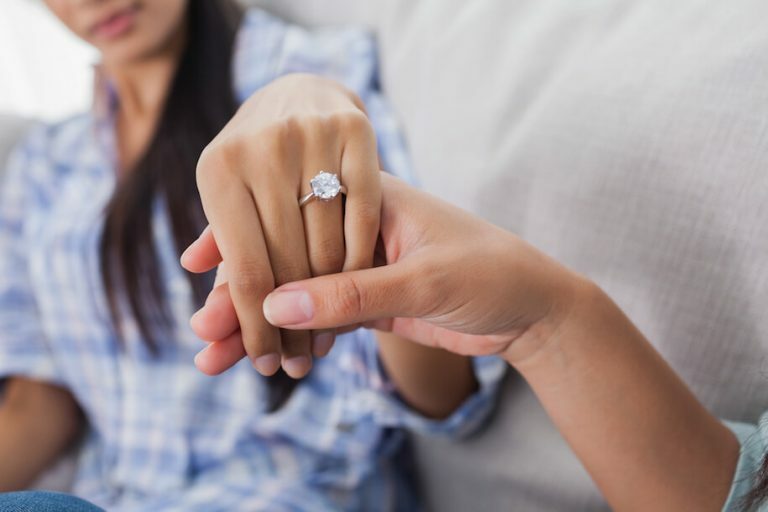 For those that love the look of something more streamlined, a Princess cut solitaire might be the perfect choice for them. The fine ring trend has never been so big, so it is no surprise that many brides to be are requesting understated fine rings. One style which is particularly popular is fine pave set diamond bands. This look reduces the visibility of metal and creates a beautiful sparkling diamond look. Many celebrities have opted for this look in recent times which, we think, has helped set the trend across the globe. With some of the biggest names in Hollywood; Angelina, Mariah Carey, Beyonce and Kim Kardashian to name a few, receiving extravagant Emerald cut diamond rings, this style has become widely sought after. Many women across the globe have been inspired to create their own piece of Hollywood bling. Rose gold is having a very long moment in terms of fashion trends. We think it is a stayer. People all over are falling in love with rose gold, it suits so many skin tones and is beautifully soft and subtle. The best thing is, is that white diamonds, pink diamonds, cognacs and blacks diamonds all look divine when setting into rose gold.